Celebrate 10 years of Wee Bop! To celebrate our 10th birthday, the Wee Bop teachers hit the recording studio to record our first ever CD of great kids music to be released on 10/10/2015. The CD features favorite songs from class such as Sleeping Bunnies and Sticky Bubblegum as well as some brand new originals like "At the Park" by our own Sarah Morris and "Shake Your Egg" by Ms. Chellie. Click below to hear tracks from the CD. Wee Bop's first CD! It's full of class favorites and originals the whole family will love. On October 10th many friends and families came out to celebrate Wee Bop's 10th birthday and the release of our first CD at Northeast United Methodist Church in Northeast Minneapolis. Thanks to all who helped us celebrate! Mmmmmwah! In 2005, while trying to figure out how to put her passions for singing, performing and working with kids all together, owner, Chellie Brown started Wee Bop part-time in Northeast Minneapolis while keeping her corporate job "on the side". Two years later she was teaching classes full-time at the Wee Bop studio, at neighborhood preschools and through the Roseville ECFE program. She is certified to teach the Musikgarten curricula but quickly moved toward writing her own material and using songs that appeal to both children and adults. In 2012 Wee Bop started offering classes in the Linden Hills neighborhood in South Minneapolis through the Lake Harriet House of Music. 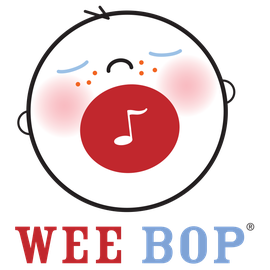 In 2015 Wee Bop has six teachers and three locations! Thank you to all the families who have helped us reach our 10th year!